Bali is one of the world’s favorite destinations if people are looking for a place which is full of leisure with tropical atmosphere. There is no doubt that people love Bali because it has very beautiful natural landscape which is combined with the cultural atmosphere which is very thick in the island which is part of Indonesia archipelago. Bali is also well known as the place which is thick of art atmosphere because various kinds of art product including wood carving can be found in this island. It must be true that among the time which is used for enjoying the beautiful view as well as beautiful culture in this island, people can also have fun by seeing the woodcarving art product from some art center in Bali. People can makes sure that there will be something missing when visiting this island if people do not check the wood carving center in this island such as in Ubud and at least bring small souvenir which is made from wood which is crafted manually by the artist in Bali. Made Budiasa is one of craft gallery and souvenir centers in Bali Island that has many kind design of wood carving craft, from a simple classic design to a very special & exotic one. 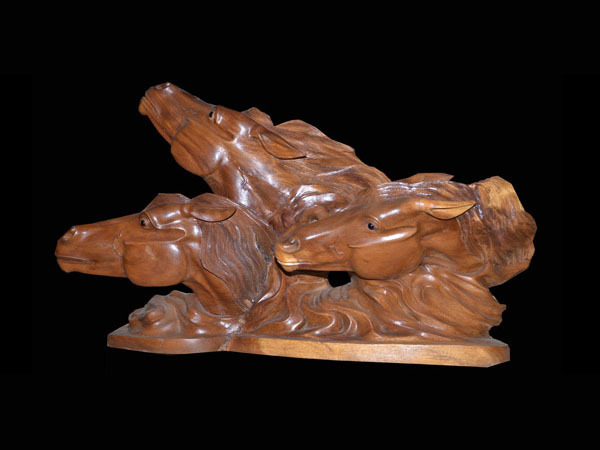 Made Budiasa sells various kind of wood carving in the form of abstract, chair, table, statue, window, basket, cupboard, door, lamp, rack, picture frame, and wall hanging that are made high quality wood. All this products are made of the finest material like rattan and other nature materials, with traditional or local uniqueness theme by the best craftsmanship. Made Budiasa supplies various kind of wood carving with different motif and size, starting from miniature with small sizes for home decoration, until big statue. Made Budiasa also provides ready-made products and reservations in wholesale and retail by consumer design and desires. So, if you want to order an export quality of Bali wood carving or just buy a special gift, you can contact this gallery by an email or come directly to gallery. All products at very reasonable price.